oh yeah....that's because it was. There is no soreness left, and I was able to get a deep tissue massage today without jumping off of the table so I guess that means it is time to race again! :) It is race season after all. This year, that was expanded a bit, and will range from July 2012 to February 2013. And maybe March - debating on tacking on another 50 the month after Rocky that I have never done before but looks like alot of fun. Yes, an intervention may be necessary. Did I mention that I LOVE these races?? I really do. That is why I keep coming back. Some days I really do not want to run. I mean I REALLY do not want to run. But, I do want to be able to enjoy the race day experience, so I run anyway. Most of the time. I'm sure you have noticed by now, I am in no way a training Nazi, especially considering all of the upheaval in my life over the last couple of years. I have really learned to embrace quality miles over quantity. 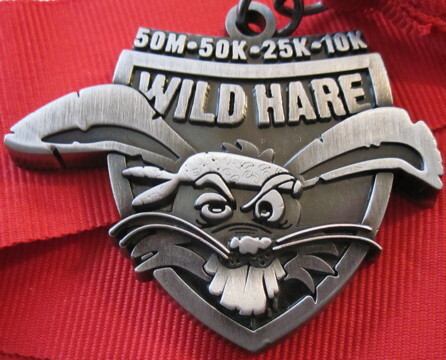 I feel healthy and strong, and I am optimistic about another PR at the Wild Hare 50 miler this weekend. 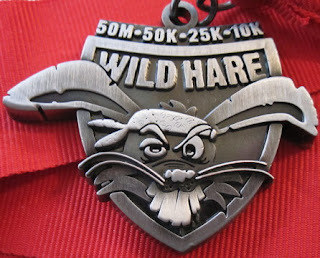 The first year I did the Wild Hare 50 miler, my finishing time was 11:48. Last year, I finished in 11:13. I am hoping to beat that, and - best case scenario - I would like to come in under 11 hours. 10:59:59 would make me happy happy. 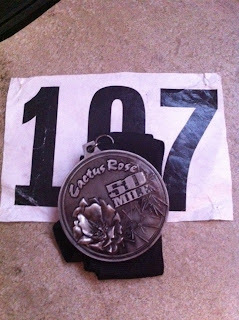 :) But, alot can happen over the course of a 50 mile trail run, so I will take what it gives me. One thing I love about ultra distance events is that even if I have a "bad" time, there are not many people who would be qualified to criticize me - and those who are qualified, who have done 50 and 100 milers, are usually the most supportive people on the planet, so its a win win. I tent camped with friends for Cactus, and I am once again tent camping for Wild Hare, but this time I am bringing Josh, my 13 year old son with me. (Shelby, my 15 year old, is staying behind for a speech tournament. This is the first year I won't have both of my kids with me at this race.) A couple of times a year I will take the kids out of school on a Friday to bring them to a race. I figure they can learn more from being in that kind of environment where people are doing what so many believe is impossible than they will in school on that particular day (apologies to my teacher friends). It is very important to me to expose my kids to different experiences, so that nothing seems out of reach for them. When faced with something difficult, I want them to think, "If my mom can run 100 miles, I can do this". They weren't able to be with me for my first 100 miler, so I was very happy to have them with me last year. They were there when I finished every 20 mile loop, and theirs' were some of the first hugs I got when I crossed the finish line. That is as good as it gets. Bluff Creek Ranch is off the beaten path so make certain you have the details of the directions and turns before you leave home. 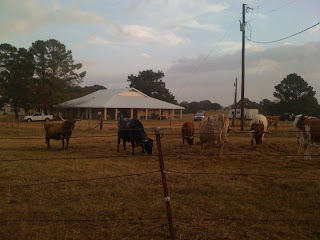 It is off the major highway and then off the side road as well. You might could find it accidentally, but I doubt it. Copy the directions and bring them with you. 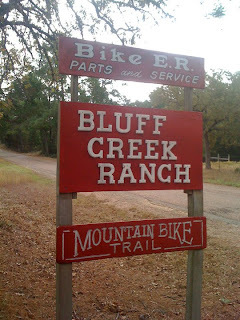 Once you find the town of Warda, which is just a bump in the road, then you must find Owl Creek Rd. Once on that, you are pretty close. If you can't find your way to the race with road signs and maps, you definitely should NOT be running a trail race. Yes, that is actually my foot after Warda in 2010. 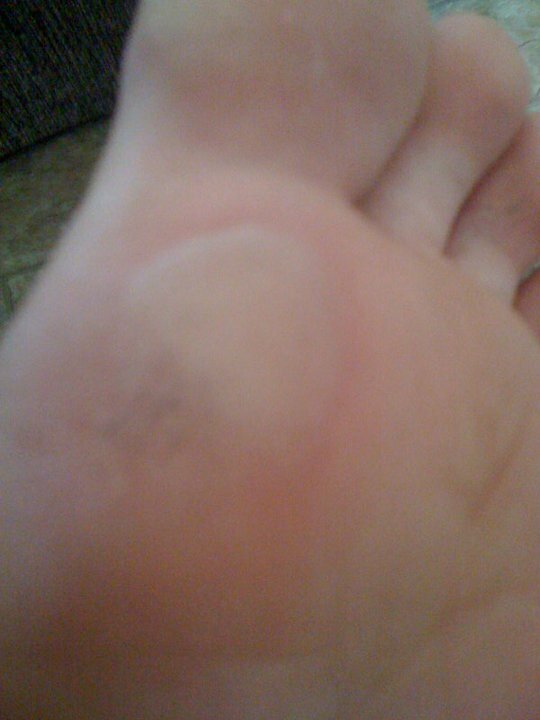 That thing felt like jamming a piece of glass into your foot for every step of the last 7 - 8 miles. I think my kids learned some new words that night when I peeled my socks off. So, I will spare you the details of the pre-race packing. It will be similar to Cactus, except that the aid stations here will be fully stocked. I will still bring my favorite snacks to set up at the start/finish area for between laps, but everything else is covered. I will get Josh to update my FB with my race info, if there is cell coverage (I don't remember). Tim and Karin Gill, Christina Gravish, Liz Wooster, John Robideaux, Aaron and Molli Davis!!!! Yaaayyy! !